Band performance times have been announced for the eighth annual Monster Energy Welcome To Rockville, taking place Friday, April 27, Saturday, April 28 & Sunday, April 29, 2018 at scenic Metropolitan Park in Jacksonville, FL, along the St. Johns River. 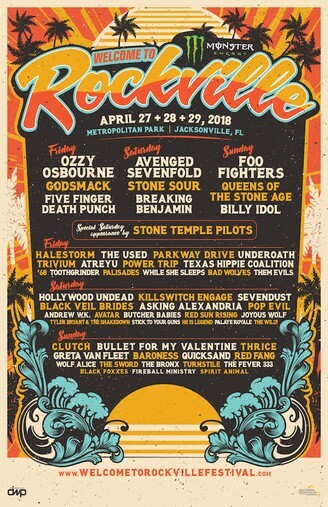 Florida’s Biggest Rock Experience grows to three days in 2018 and features sets from Foo Fighters, Ozzy Osbourne, Avenged Sevenfold, Queens of the Stone Age, Billy Idol, Godsmack, Stone Sour, and Five Finger Death Punch, who lead an incredible talent lineup not seen at any other U.S. rock festival. In total, more than 50 bands will appear on three stages over the course of the weekend. Limited tickets are still available at www.WelcomeToRockvilleFestival.com. Festival doors open at Noon on Friday and 11:00 AM on Saturday and Sunday. In addition to performances from top music artists, attendees at this year’s Monster Energy Welcome to Rockville will enjoy a variety of onsite food and beverage experiences. Grub Zone: Food and Beverage options will be provided by Southern Hospitality Concessions LLC, DWP’s affiliate concessionaire. Patrons can enjoy some of Jacksonville’s local favorite restaurants, cuisine and food trucks such as: Mojo’s BBQ, Pele’s Wood Fired Pizza, Indochine Thai Cuisine, Cruisers Grill, The Bread and Board, Island Noodles, GuanaBana Ice Pops, Brucci’s Pizza, Cely’s Philippine Cuisine, Knuckle Sandwiches, Grumpy’s Homemade Ice Cream, Dos Vatos Tacos, What’s The Catch Fish Tacos, Chinchilla Eatz on the Streets, Mambo on Ruedas Cuban, Wingin It, Cousins Maine Lobster, Sweet Pete’s, Maple Street Biscuits, BC Tacos, Mama’s Greek Cuisine Food Truck and much, much more. Beverages: Festivalgoers 21+ can enjoy a variety of beverages at one of the festival’s many bar locations. Specialty experiences include Caduceus Cellars & Merkin Vineyards Wine Garden (owned by Arizona resident Maynard James Keenan, co-founder of international recording acts Tool, A Perfect Circle and Puscifer) and the Heavy Tiki Bar (a tropical oasis filled with killer island cocktails and shade). Guests can also stop by Mrkt N Jolt to grab a hot coffee, cold brew or other sundry items. Bud Light, Samuel Adams Sam ’76, Jack Daniel’s, Three Olives Vodka, Kraken Black Spiced Rum and Jose Cuervo Tequila will be available throughout the festival grounds. Monster Energy Welcome To Rockville will feature a variety of unique entertainment options to go along with the incredible music lineup, including the Monster Energy Experience (where fans can meet Rockville artists), the Jack Daniel’s Experience, The Music Experience and The Student Experience, the Fearless Records Experience, the Jacksonville Jaguars VIP Rock N Jock Experience (with the Jacksonville Jaguars and Stone Temple Pilots) and the f.y.e. Fan Experience (where fans can purchase music from all the performing bands and take part in meet & greets and artist signings). Monster Energy Welcome To Rockville tickets, Saturday VIP packages, and camping options are on sale now. Hotel packages and all other VIP packages are sold out. 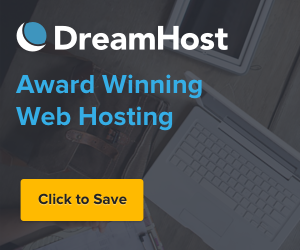 Discounted online hotel rates are available through Curadora. Visit www.WelcomeToRockvilleFestival.com for all the details. Monster Energy Welcome To Rockville is fueled by Monster Energy. Additional 2018 sponsors include: Bud Light, Samuel Adams, Three Olives Vodka, Kraken Black Spiced Rum, Jose Cuervo Tequila, f.y.e., Jack Daniel’s, Zippo, SWFTCharge, The Music Experience, US Army, Fearless Records, Roadrunner Records, Rise Records, Fxck Cancer/Dyin 2 Live, Take Me Home, Love Hope Strength, Jacksonville Jaguars, and Southern Hospitality Concessions LLC. Monster Energy Welcome To Rockville is produced by Danny Wimmer Presents, a producer of some of the biggest rock festivals in America, including Rock On The Range, Monster Energy Aftershock, Louder Than Life, Bourbon & Beyond, Monster Energy Carolina Rebellion, Chicago Open Air, Monster Energy Fort Rock, Monster Energy Rock Allegiance, Northern Invasion and more. Monster Energy Welcome To Rockville kicks off the annual World’s Loudest Month festival series, which features the biggest names in rock music performing in six U.S. events in distinct atmospheres during five consecutive weekends in April and May of 2018.